"Avoid the company of the wicked or you will pay a heavy price for it". Once upon a time there were two friends in a small village named Dharmabuddhi (Virtuous-Mind or Right-Mind) and Papabuddhi (Wicked-Mind or Wrong-Mind). One day, the wicked of the two, Papabuddhi, thought to himself that he was poor and lacked the knowledge to earn for himself. He thought of taking Dharmabuddhi to another kingdom and use his skills to make money. He thought, "If I can deprive him of all the earnings, I can have all the money for myself and live happily"
After some time, he met Dharmabuddhi, "My friend, we need to earn money to provide for ourselves when we grow old. Let us travel to some other kingdom to earn money. Besides, unless we travel to far-off kingdoms, we will not have any stories to tell our grand children!" Dharmabuddhi agreed to his plan, and took the blessings of his parents and teachers to travel to a distant kingdom. On an auspicious day, they began their journey. The two of them made a lot of money due to Dharmabuddhi's skills and knowledge. After some time, pleased with their earnings, they planned to return home. 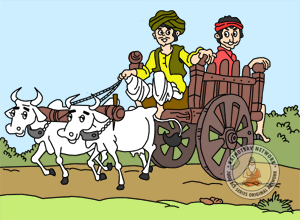 On their way to their home, as they approached their village, Papabuddhi said to Dharmabuddhi, "Friend, It will be improper for us to carry so much money home as all our friends and relatives will start requesting us money. Besides, there is danger of theft." He said, "Let us bury the money in the jungle, where nobody will find it, after taking only a nominal amount for our needs. Whenever we need some money, we can come back together and dig it out". Without doubting his intentions, Dharmabuddhi agreed. They buried most of the money beneath a tree and returned home with only a handful of money. Few days later, Papabuddhi, wrong-minded as he was, went to the jungle alone in the dead of the night. He uncovered all the money they had buried together, took out all the money, and closed the pit as it was before. He returned back home with all the money, and hid it. After a few days, pretending that nothing has happened, he went to meet Dharmabuddhi, "Friend, I have a large family and the money I had come with - have been spent already. Let us go together to the place we have buried our money to fetch some more." 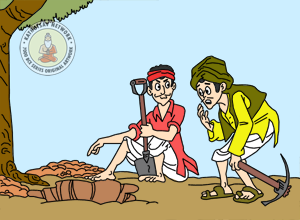 Dharmabuddhi agreed and together they went to the place they had buried their money, and dug up the pit. But they found the money was not there. Papabuddhi started beating his head, and blamed Dharmabuddhi, "It is you no doubt. Nobody else knew where we have buried the money. You have stolen all the money for yourself. If you do not give me my half of the money, I shall go and complain to the village elders for justice." Taken aback, Dharmabuddhi protested, "I have committed no such theft. Don't put the blame on me, as I am a virtuous man". And so, they started quarrelling, and visited the village elders for justice. The elders asked them to pledge before the Fire-God to find the truth. 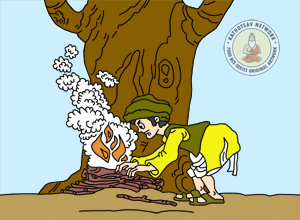 Papabuddhi suggested, "Before pledging before the Fire-God, we can request the spirit of the tree to stand witness. It was in front of a big tree that we had buried all the money; and it may be able to reveal to us who the thief is". The judges agreed, "We shall go the jungle together, and request the spirit of the tree to reveal the truth to us. If that fails, we will take pledge before the Fire-God." Papabuddhi immediately went home to his father, "I have stolen a huge amount of money from Dharmabuddhi, and we have taken the matter to the village elders. Your co-operation will save me and put the blame on Dharmabuddhi. Otherwise, I shall not only lose the money but face the risk of losing my life for stealing". His father said, "My son, tell me how I can help you so you don't have to part from the money". 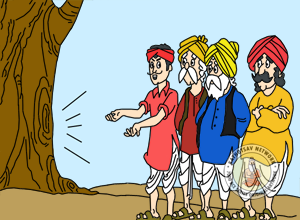 Papabuddhi explained, "There is a huge hollow inside the big tree where we had buried the money. You have to get inside the hollow before morning. When all of us go to the jungle as request the spirit of the tree to reveal the truth, you have to shout from inside that Dharmabuddhi is the real thief. I can handle the rest." As agreed, his father went to the jungle and hid himself in the hollow of the tree early next morning. 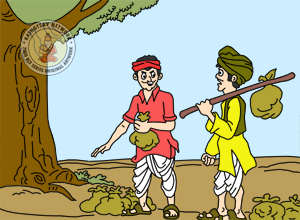 After some time, accompanied by the elders of the village, both Dharmabuddhi and Papabuddhi led themselves to the huge tree where they had buried their money. Papabuddhi asked in a loud voice, "O spirit of the tree. Please tell us who the thief is, as we have a confrontation and the village elders have come to seek the truth." Immediately, Papabuddhi's father replied from inside the hollow of the tree, "Listen all who seek the truth. Dharmabuddhi is the thief, who has stolen all the money." The village elders were wonderstruck. They could not deny that the spirit of the tree had indeed revealed the truth. They immediately started discussing amongst themselves how they should punish for Dharmabuddhi's guilt. Meanwhile, when Dharmabuddhi heard the spirit of tree speak such, he became sure that there must be something wrong. The spirit of the tree, if it was so, is telling untruth. That is not possible. Having seen the hollow of the tree, he put a heap of dried leaves and grass in front of the hollow of the tree and set fire to it. When the fire started flaring up, Papabuddhi's father could not bear the heat and the smoke inside the hollow any longer. He came out, with burns in his body, crying for pity. The village elders were surprised to find him coming outside from the hollow of the tree, "What were you doing here? And what has happened to you?" He at once confessed his part, and explained the village elders what his son had done. 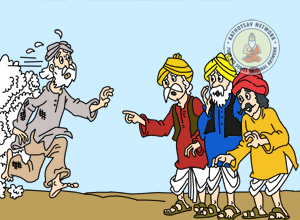 Thus, the village elders came to know of the truth, and decided to punish Papabuddhi for his guilt for theft, to blame it on Dharmabuddhi and misleading the village elders. They decided to hang Papabuddhi on the very same tree, and praised Dharmabuddhi for his wit. Avoid the company of the wicked or you will pay a heavy price for it.